This collection of poetry is as much about love and people in and out of relationships as it is about origins and the process of estrangement. The lantana is a flower of South American origin, and the ixora of Asian origin. The lantana, a creeper that grows profusely, often engulfing other plants, provides a ready metaphor for the consciousness of the Americas overcoming that of India in the Americas—the mainstreaming and divesting of yoga from its Indian origins being the most visible manifestation. Sasenarine Persaud is an essayist, novelist, short-story writer, and poet. He is the author of ten books: seven poetry collections, two novels, and a book of short stories. His latest book, In a Boston Night, was published by TSAR in 2008. He was born in Guyana and has lived for several years in Canada. He has served as a vice-president and chair of the membership committee of the League of Canadian Poets, on the Board of Directors of the Scarborough Arts Council (Toronto), and on juries for the Toronto Arts Council and the Ontario Arts Council. He presently resides in Tampa, Florida. The Tampa launch of Lantana Strangling Ixora will be at the New Tampa Regional Library (10001 Cross Creek Blvd, Tampa, FL 33647) on Saturday November 5, 2011 at 3:00 PM. This event is hosted by the Tampa-Hillsborough County Public Libraries. 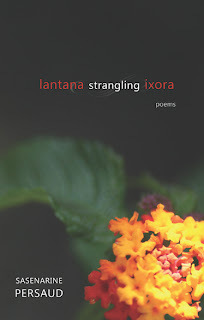 Lantana Strangling Ixora was launched at the University of Toronto on October 2, 2011, as part of the Festival of South Asian Literature. I gave two readings during the festival and participated on a panel discussing Indo-Caribbean Literature. All TSAR Publications books are available from bookstores, online booksellers, and wholesalers.